Tegan and Sara are two of the most visible queer musicians working today. And for their latest music video, they paid tribute to the many gender performance trailblazers who came before, as well as spotlighted younger activists who are working to continue that legacy. In that vein, Tegan and Sara turned their video over to some folks whose life work is in spreading love for everyone, and for themselves. The cast, made up of trans and gender-nonconforming actors and activists is as follows: Ella Giselle as Madonna, Olabisi Kovabel as Grace Jones, Dominic Ravina as Elvis, Cooper Treibel as David Bowie, Tyler Ford as Prince, and the Eli Erlick & Ni Ching-Marino as Tegan and Sara themselves. 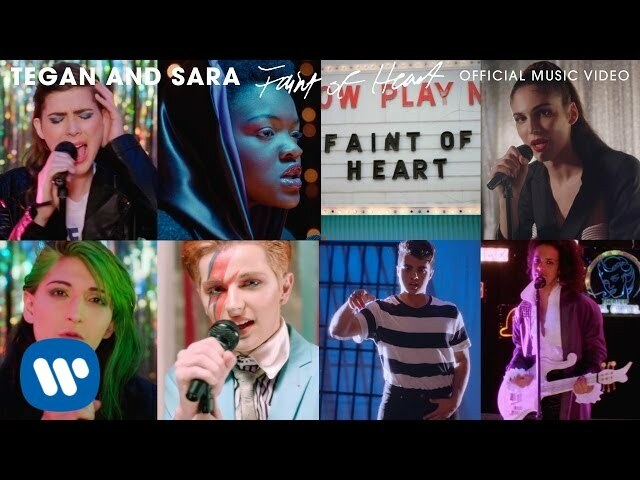 We’ve got nothing but love for everyone involved in “Faint of Heart,” and hope more artists can, like Tegan and Sara and their creative collaborators, make activism a core part of their art.